Are you looking for a chewy bread that has a slight crunch on the outside and is soft on the inside? These French rolls are great snacking bread that tastes delicious buttered or made into sandwiches. To keep the texture of these rolls, never store them in plastic bags. Use paper bags, and use the rolls on the same day you bake them. In a large bowl, mix the water and yeast until the yeast is dissolved. Stir in the salt and enough flour to make a soft dough that can be kneaded. Turn the dough out onto a lightly floured board and knead it for about 8 minutes. If the dough gets too sticky, dust it lightly with flour and continue with kneading. You want the dough to be soft, not hard. Grease a medium-size bowl. Put the dough into the bowl and then turn the dough over so that the top of the dough is also lightly greased. Cover the bowl with a clean kitchen towel or plastic wrap and let the dough rise in a warm, draft-free place until it is doubled in size or about one hour. Punch down the dough inside the bowl. Cover the bowl and let the dough rise again for 1 hour, or until it is doubled in size. Turn it out onto a floured table or surface and knead out all the bubbles for about 5 minutes. Divide the dough into 12 equal pieces and shape into round rolls. Place on greased baking sheets and cover to let rise a third time for 1 hour. Remove the cover and flatten each roll on a lightly floured surface with the palm of your hand. Fold roll in half and then in half again to shape the long roll and taper the ends of each roll to a point. Place the rolls back on the greased baking sheets, cover, and let rise a final time for about 45 minutes or until doubled. Bake the rolls at 400 F for about 20 minutes or until they are golden brown. Remove the rolls from the oven and turn them out onto a rack. Serve them warm or cool. Use bottled water instead of tap water to make your bread. 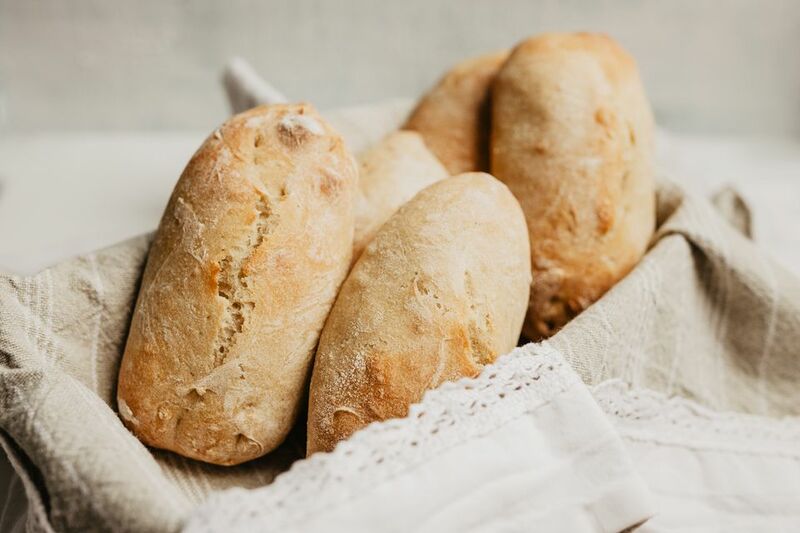 Water softeners and chlorinated public water can sometimes kill the yeast needed to make your bread dough rise. Spraying loaves with water while they bake will produce a crispy crust. Brush loaves with egg white before baking to produce a shiny crust.